Llyn Ystradau was formed in 1963 to make a holding pond for water coming down from the Stwlan dam, high above on the shoulder of the Moelwyn. Water is pumped back up at low-peak times, so the levels in the lake vary considerably. Parking is available at the cafe car park, just beyond the FR station. From here, walk back along the road until a gate with a stile is reached, where the path runs along the dam wall. Walking along, there are impressive views of the Moelwyns and Cwmorthin. The vertiginous incline leading up the slopes of Moel Hydd, across the llyn, runs through a tunnel at the summit to the old Wrysgan slate mine. 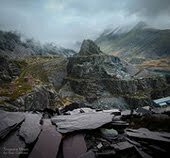 A glance at the slopes of the Moelwyns will reveal evidence of much mining activity, now settling quietly back to nature, leaving evocative ruins for those energetic enough to find them. Just before the end of the dam, a path goes off down to the left, crossing the spillway by a set of steps. Climb up the other side and scramble to the end of the dam. I always think the scene here is like something from an old “Avengers” episode, with the brutalist architecture of the dam and the spruces giving an eastern european feel. I half-expect Emma Peel to emerge from the trees, regarding us in that cool way that she had… then I remind myself that this is Tan-y-Grisiau. Although episodes of Dr. Who were filmed in this valley and in the quarries across the Llyn. Not quite the same, though. The path, more like a muddy stream bed at times, leads across the moor, climbing towards the bulk of Moel Ystradau. This is basically a large dyke of Syenite, a very hard form of granite left after the intense volcanic activity here millions of years ago. Much of the hill has been quarried away, at first for cobbles, or setts, much in demand at the turn of the C19th for paving streets with tramway rails embedded within them. The “Syenite Setts Quarry Co.” was set up in 1874 and dissolved in 1916. There was a nearby powder storage facility operated by the “Elterwater Powder Co.” to supply blasting materials for the many quarries locally. As you walk down the quarry incline to the level of the Llyn, the terraces where the stone was extracted can be made out. There was a siding in the floor of the quarry leading from the Ffestiniog railway. 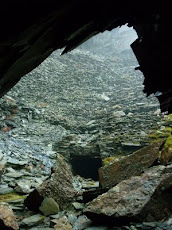 Later, the quarry was reopened as the “Moelwyn Granite Quarry” (or “Brookes”) and produced setts and chippings which were carried away by train.The quarry was stripped of it’s machinery in 1952. Remains of an old haulage cable and pole at the quarry. Depending on the level of the water in the dam, it’s possible to walk along the floor of the quarry towards the old Ffestiniog Railway tunnel entrance, now plugged. There’s a higher path, too. It’s hard to believe that there was once a chapel and a stable here, along with a warehouse, cottage and even a post box!. The course of the old line can be seen here, running across the lake. The tunnel wasn’t the first crossing of the hillside here by the railway. The ridge was originally traversed by inclined planes from 1836-42. The north incline was powered by waterwheel, using water from the archer dam near the present course of the railway. It’s worth walking up to the summit of the incline to take in the view and if you are eagle-eyed, to find the 17-hole rock cannon here. There’s a full description of the use of these pyrotechnic curiosities here. This cannon is bored into the country rock, and is difficult to find…It took us two attempts. The old Moelwyn tunnel opens out to the left. 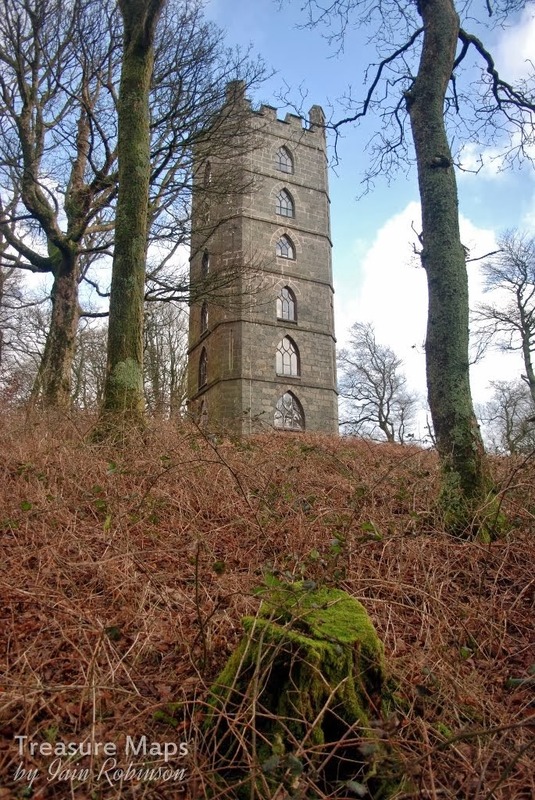 It was opened on the 24th May, 1842. The bore is 730 yards long and is quite straight. It was very narrow, 9’6” high and 8’ wide…just enough for a train and nothing else! The railway here was severed by the CEGB in the nineteen fifties when the pumped storage scheme was proposed. It’s not hard to imagine the hubris with which the officials treated the volunteers from the Ffestiniog Railway when they tried to oppose the scheme, at least in as much as it affected their railway. They could have had no idea that amongst the supporters and admirers of the railway were many eminent men of law, not to mention politicians and civil servants. In a true David and Goliath victory, the railway was able to re-align and skirt the reservoir on a higher level, successfully claiming significant damages from the CEGB. The line now travels through the new Moelwyn tunnel, dug by a team of cornish miners – it is 287 yards long and was opened in 24th June, 1977. As a spotty teenager, your scribe pushed several tons of spoil out of tunnel cutting during a spell of volunteering. The path leads below and parallel to the railway now, passing the site of an old siding for the Moelwyn Zinc Company’s mine. I’ve covered this in another Treasure Maps post, here. Soon, the path climbs up onto the original trackbed, passing the ruined processing area of the mine. Now, the power station looms ahead, although it has been a malign presence, glimpsed during the entire walk. I’ve nothing against the power station, in fact I think hydro-electric power is rather exciting and very environmentally friendly. There are countless schemes in Wales and in Scotland where I have admired the architecture of such places…and the associated transformers and frankensteinesque equipment has a certain charm all of it’s own. But the buildings housing the turbines have nothing to commend them. The turbine hall does admittedly have stone clad walls, but the other structures are built from unnatural and unsympathetic materials. One such is of resin powder coated steel. It won’t even have the decency to rust. The facts stack up impressively. The Power Station is a 360 megawatts pumped storage hydroelectric scheme. Inside the hideous building at the lower reservoir are four water turbines, which can generate 360 megawatts of electricity within 60 seconds of the need arising. The station, commissioned in 1963, was the first major pumped storage system in the United Kingdom. Llyn Stwlan, on the mountainside high above, drops 27 cubic metres per second of water to the turbine generators. The path goes between high barbed wire fences and climbs steeply to the railway, where it crosses. The track here has heavy-duty check-rails, to arrest the progress of a derailment and protect the power station. These rails were installed at the behest of the electricity people, who now have a healthy respect for the railway. The walk back to the car park is now an easy one, passing spoil tips on the left from the construction of the Stwlan dam. The round trip takes about 1.5 hours and except in the driest weather, it’s a good idea to have boots or waterproof footwear! Very interesting - looks like a good walk. I've looked down on the top reservoir and seen the bottom one from a distance from Craigysgafn before. Will need to have a wander around those parts some time. That power station does look rather hideous. Pity they weren't compelled to build something more akin to the one at Cwm Dyli. You must have been pleased to find the rock cannon this time around. I wonder how they used to dry out the holes before using them. Yes, I wouldn't have a problem with something that looked even a little bit like Cwm Dyli. The rock cannons...I guess they didn't have absorbent kitchen towels or sponges...that's a very good thought! You would like the Moelwyn Zinc mine, that alone would make the walk worthwhile for you...and I'd like to see the photos very much! Thanks for the tip - I'll add it to the (ever increasing!) list. Yes, I find I have to concentrate...luckily my partner in crime is doing the same (and producing better photos than me!) You are also right, though, that sometimes it just happens. I guess you have to relax and be able to react to the scene, and that's difficult when I'm with people other than my missus.